Argentina’s Macri Tough Luck… and then some | CALÍBAR el rastreador The election of President Mauricio Macri a year ago was seen as another turning point in Argentina’s troubled economic history with the administration’s first economic measures praised as a complete success. The administration liberalized the country’s capital market, allowing the peso to move freely and negotiated an end to the stand-off with U.S. courts regarding the holdouts from the country’s 2001-2002 default. It also eliminated some of the taxes imposed on the exportation of agricultural products, and it embarked on an ambitious campaign to rid the economy from highly pernicious subsidies to public utilities, including electricity and natural gas consumption, among others. The election of President Mauricio Macri a year ago was seen as another turning point in Argentina’s troubled economic history with the administration’s first economic measures praised as a complete success. The administration liberalized the country’s capital market, allowing the peso to move freely and negotiated an end to the stand-off with U.S. courts regarding the holdouts from the country’s 2001-2002 default. It also eliminated some of the taxes imposed on the exportation of agricultural products, and it embarked on an ambitious campaign to rid the economy from highly pernicious subsidies to public utilities, including electricity and natural gas consumption, among others. However, the early successes and praises have given way to several setbacks as well as some obvious consequences, i.e., higher inflation, as the administration took measures to dismantle the public utilities subsidies’ scheme, a scheme that was fiscally unsustainable and that had created serious problems with the efficient allocation of resources.1 This has given renewed space to the opposition and labor sectors that opposed the administration and has clouded the environment. In order to grow, Argentine officials need to control and reduce inflation and inflation expectations and pray that the global economy, especially Brazil and China, starts growing faster over the next several years. From this vantage point, although we are expecting the Brazilian economy to start to improve, we still see growth prospects in China to continue to weaken. Thus, Argentina’s growth prospects will have to depend on its domestic market, therefore, inflation will need to remain the first priority for the Macri administration. 13.0 percent since then due to the surge in inflation that followed the nominal depreciation (see Figure 5 below). 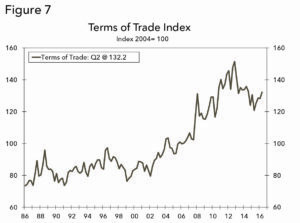 Thus, the more limited depreciation in real terms could exercise some restraint on export performance going forward and potentially call into question the need for further depreciation of the currency. This would put further pressures on inflation expectations. Thus, Macri’s administration’s tough luck will remain for a while until its policies start to work. Hopefully, growth will return in 2017 and these risks will start to dissipate. Many times politicians congratulate themselves for the good times and try to desperately distance themselves when bad times knock on their doors. Sometimes they even blame somebody else or somebody else’s policies for the bad times. However, many times, rather than good or bad policies, much of what happens to an economy is the result of good luck or bad luck, i.e., a good crop year versus a bad crop year, a good external environment versus a bad one, high petroleum prices versus low petroleum prices, etc. Of course, good policies tend to potentiate the good luck while bad policies tend to potentiate the bad times. Furthermore, even good policies during bad economic times are almost never enough for an economy to perform well and/or to salvage those unlucky enough to be in power during those periods of time. Good luck can also hide the consequences of really bad policy decisions, as it was in the case of Brazil and Argentina during the commodity boom cycle that started in the early part of this century. In this context, the successive Kirchner administrations greatly benefited from the global surge in commodity prices and exports driven by strong Chinese economic growth, while the Macri administration is suffering from the opposite environment—a collapse in commodity prices and very weak growth in exports due to the slowing Chinese economy. After almost 12 years of “good luck” and the implementation of policies that have compromised the sustainability of economic growth by the successive Kirchner administrations, current president Mauricio Macri has been facing bad times, while at the same time, trying to unwind the policies implemented by the Kirchner administration. Furthermore, Macri’s bad times have been mixed with policy choices that have been less than effectively implemented, which have worsened the conditions of the economy. Catapulted by the early success in reopening the economy and freeing the country’s exchange rate system, the Macri administration embarked in a very risky but necessary reform of the subsidy scheme implemented by the Kirchner administration during the previous 13 years. These massive subsidies have caused a large hole in the country’s fiscal accounts. The Macri administration’s strategy was to get rid of all consumption subsidies in order to reduce the pressure on fiscal accounts. However, it seems that the administration did not take into account the consequences of this sudden shift on economic activity, especially the effects on personal income and consumer demand. Furthermore, there were two unexpected problems during the implementation of the new policy. First, the elimination of subsidies on the consumption of natural gas, which is the primary fuel source used to heat homes, meant a very large increase in the natural gas bill for households. However, the problem was not limited to an increase in price due to the elimination of the subsidy. The situation for consumers and for the government got more complicated because the winter of 2015 was a very warm winter, a winter that did not need households to turn on their heaters. However, the winter of 2016 was a very cold winter in the Southern Cone of South America and that meant that households needed to have their heaters on continuously and at full throttle. In many circumstances, natural gas bills were more than 500 percent higher than in the previous year. This represented a large shock for household budgets as well as for inflationary pressures. Second, consumer groups went to court to stop the increases in utility prices and won several preliminary injunctions by which the Macri administration could not implement the rationalization of utility prices. Courts finally sided with the Macri administration but told the administration that they needed to conduct “public views” before implementing the change in prices every time there was a proposed increase in utility prices. Today, the government has succeeded in eliminating the subsidies but the whole episode took away much of the goodwill entrusted to the Macri administration and now several sectors of society that were on President Marci’s side have started to distance themselves from the administration less than a year after it took office. At the same time, the labor unions united under a unique national labor union umbrella, which makes their ability to pressure and/or oppose government policies stronger than it has normally been the case in this country. This is, perhaps, one of the most distinguished characteristics of Argentina’s labor union movement. Normally, during a Peronist government the labor union movement divides into different labor organizations that tend to not coordinate their actions. However, whenever there is an opposition (to a Peronist) government, then they unify to limit the ability of that opposition government to govern.2 Today, the labor union is up in arms and threatening to stop the country if the Macri administration does not change its policies. Another aspect of President Marci’s “bad luck” is that he does not have the resources the Kirchner administration had to “spread-the-wealth” within the country. By taxing agricultural exports during the time of the commodity and export boom cycle the Kirchner administration was able to capture a large swath of revenue to be used in its subsidies’ policies over the years. However, President Macri’s administration started with a very negative external environment. 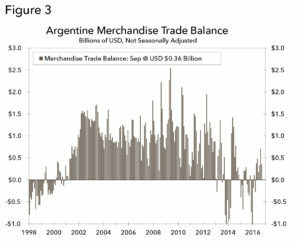 At the same time, the Macri administration eliminated and/or reduced the taxes on some commodity exports imposed by the Kirchner administration more than a decade ago. Thus, the Macri administration has faced strong pressures on its fiscal accounts even as commodity prices have recovered somewhat, or at least have stopped declining. 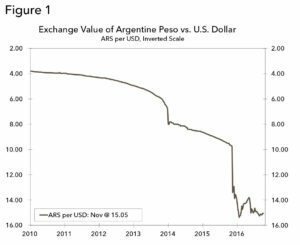 Meanwhile, while the Kirchner administration was financing the fiscal deficit by imposing taxes on commodity exports, by expropriating savings, from individuals and private companies, and via monetary financing, the Macri administration has started to finance the fiscal deficit by accessing international capital markets.3 This was one of the reasons why the Macri administration was so eager to solve the problem with the default holdouts early in its tenure. 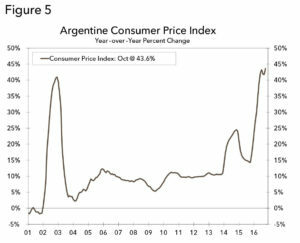 During the Kirchner administration, expansive fiscal and monetary policies created a perfect storm in terms of inflation even though the administration tried to hide the inflation problem by tweaking the consumer price index. However, all this intervention in the economy created serious economic misalignments that are coming home to roost today and are affecting the Macri administration’s stance with the country’s citizens. On the trade side, the first decade of the century saw one of the most impressive improvements in Argentina’s terms of trade in history. 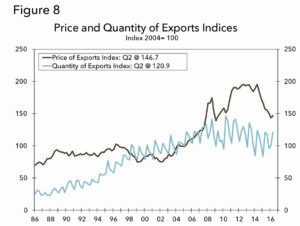 The terms of trade are the ratio between the price of exports and the price of imports. 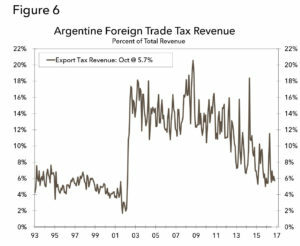 As stated before, the improvement in the country’s terms of trade plus high export taxes represented a boom for the Kirchner administration and allowed it to conduct a very expansive fiscal policy during the first term of both President Nestor’s and President Kirchner’s administrations. Another program that the Macri administration has been putting a lot of emphasis on has been a program of capital repatriation. The government is offering individuals that have money outside the country an opportunity to “legalize” those funds by choosing to pay a penalty tax. The program offers the alternative of legalizing the funds and pay a tax penalty but leaving those funds outside of the country (this includes cash in foreign banks as well as real estate assets) or paying a tax penalty and bringing the funds into the country. According to the early estimates, the government says that, at a minimum, the repatriation would bring back $20 billion and was hoping that it will bring in as much as $35 billion. Some private estimates say that the true amount could be closer to $50 to $60 billion. If that is the case, the Macri administration would probably not need to go to the international financial markets during 2017 to finance the deficit and to pay for debt and interests coming due next year. Although the effects of this capital repatriation on economic growth are uncertain, the government’s principal interest has to do more with the tax penalty charged on those funds, which will help finance the country’s large fiscal deficit. As it is the case with this type of schemes, the success depends on how credible the program is. The scheme relies on individuals believing the government will have access to the names of the individuals that have accounts outside of the country by negotiating these agreements with countries that have been prone to make it easy for foreigners to stash these moneys without asking many questions. The Macri administration is probably counting on the fear created by the hacking of the Panama Papers earlier this year and by some new agreements signed with some of these countries. 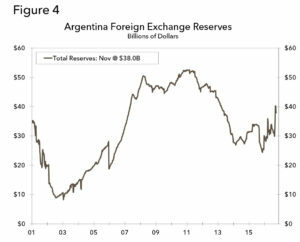 More recently, however, there is speculation that the result of the recent U.S. presidential election may threaten the government’s repatriation scheme credibility as Argentines believe that a Trump administration will not be as interested in pursuing this avenue, compared to the commitment it had from the Obama administration. So far, the government’s estimate on the capital inflows due to the repatriation scheme seems to be going according to plan. Conclusion: Economic Growth Needed at Any Cost! High inflation, large fiscal deficits, recession, etc., are not harbingers of good things to come. The opening of the capital account and the successful freeing of the exchange rate market was the biggest asset of the Macri administration. 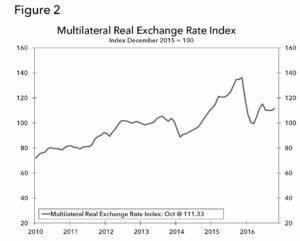 However, higher inflation has eaten into the recent nominal devaluation and today’s nominal devaluation has morphed into a strong real appreciation of the Argentine peso, which will continue to hurt exports and presages the need for another strong devaluation in the not so distant future. The Macri administration is counting on the repatriation scheme as well as on investors’ commitments to invest in the country to spur economic growth.5 However, the window is closing very fast as the administration approaches mid-term elections in 2017, which are normally not friendly to sitting presidents. Perhaps the biggest advantage that the Macri administration has is the political opposition, the Peronists, look highly divided. However, it will be a mistake to count the Peronists out as they are always a force, even if they remain divided. The Macri administration estimates that real GDP will increase north of 3.5 percent in 2017, and, if this is correct, then the political environment will improve as the mid-term elections approach. However, if inflation remains high and economic growth is not what the administration estimates, then expect a contentious political environment to become even more contentious as the mid-term election approaches. 1. One of such examples was the move, by automobile owners, to transform their automobiles to liquefied natural gas (LNG) as the price advantages of this fuel made it cheaper than the gasoline or diesel oil alternative. Today, this play is being unwound as the government has ended the LNG subsidies and automobile owners are, once again, changing back to “traditional” fuels. 2. The Peronist party or movement has a strong labor movement support so when the Peronists are in power, the labor movement divides between those labor groups that follow the Peronist party blindly and those labor groups that are not in line with the Peronist party. However, when the Peronists are not in power, the labor movement then unifies in order to have more power over the policy decisions. 3. One of those measures was the expropriation of the privatized pension system, which the administration took over, confiscating private savings amounting to about $27 billion. Other measures used to find new sources of income were the expropriation of YPF from the Spanish petroleum company Repsol, etc. However, none of these measures were enough as subsidies policies normally need increased sources of income to be sustainable over time. At the same time they create serious issues with the misallocation of resources across the economy. $200 billion mark and some go up to $500 billion, which is close to 100 percent of the country’s 2016 estimated nominal GDP. 5. The Macri administration estimates public, private and public-private investment commitments in the period 2016-2019 at $55.3 billion.